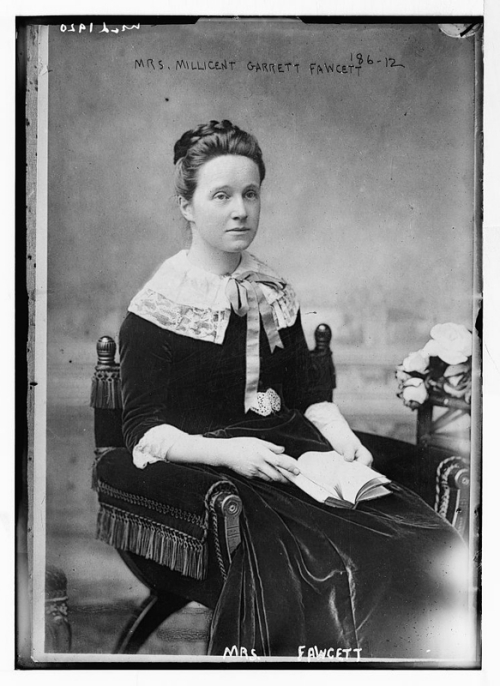 Millicent Fawcett was actively involved in politics and the suffrage movement in London, advocating public education and constitutional methods for gaining the franchise, in contrast to the confrontational and militant strategies of many of her feminist contemporaries. She joined the London Suffrage Committee in 1868 and proved to be a brilliant organizer. Fawcett believed that women’s activism should extend beyond voting rights and threw her significant clout behind the campaign against white slave trafficking and various other causes such as the protection of low-paid women workers. Much of her time was devoted to writing books, including the extraordinarily successful Political Economy for Beginners (1870); The Women’s Victory—and After (1920); and a biography of Josephine Butler (1927), a fellow English suffragist. Unknown artist. Mrs. Millicent Garrett Fawcett, 1920. Library of Congress, Prints and Photographs Division, Washington, D.C.